On the understanding that it was going to be a lovely sunny afternoon we drove over to Buttermere to take a stroll around the lake. I was assured that the injured leg, although still not fully recovered, was nevertheless up to the task and that it was time it tackled something other than a walk up the road and back. Well, we’ll just have to wait and see how it holds up. Buttermere was very busy and there were no empty spaces in our usual free parking spot up by the church, or any roadside parking so there was nothing for it but to go to the National Trust car park at the top of the village, dip into the ‘parking tin’ and pay up, grrr. As we walked from the car park down to the village the sunny afternoon had yet to materlalise and we were still looking at the remnants of the snow and rain which fell during Tuesday night and Wednesday morning. Beyond the rooftops of Buttermere we are looking towards High Snockrigg and Robinson, but the injured leg will not be tackling anything approaching the likes of those for some time yet. At the bottom of the hill we turn off to the right, past The Fish Inn, and make our way towards the lake. The two people walking towards us alongside the inn are on the path we’ll be taking. The lane eventually bends around to the left and now we are heading straight towards the lake. Sour Milk Gill, over on the right, was full and roaring down the fellside. I took a look back as we walked along the lane for this close up view of a very snowy Grasmoor, on the left, a slightly snowy Whiteless Pike, to the right, and stretching across in front of them a snow free Rannerdale Knotts. The fields and path were very wet with large pools of water everywhere and, at the moment, its all looking rather grey, damp and gloomy. I took a slight diversion from the path we were on to go to the foot of Buttermere for this view of Fleetwith Pike at the head of the lake. As you can see there is a breeze blowing but its not so strong as to make life uncomfortable. It is coming from the north-east though so it does have a bit of a nip to it. A turn to the right and then its down the path and across to the bridge to pick up the lakeshore path. Back at the bridge and it looks as though the gammy leg is holding up well at the moment. The bridge crosses the outflow, known as Buttermere Dubs, between Buttermere and Crummock Water, and its full to the brim today. The view of the Robinson to Dale Head group across the choppy water. The lakeshore path on the southern side of Buttermere offers easy and pleasant walking. It was a popular and busy path today and I had to wait a while until I could get a clear view of it. The promised sunny afternoon is taking some time to materialise as this look back shows. The top of Grasmoor is still clouded and its all looking a bit grim at the moment. A grey Buttermere under grey clouds. A little further along and it looks like the clouds are beginning to break up. Comb Beck splashing down to Buttermere with High Stile on the skyline. The highland cattle were enjoying a delivery of fresh hay. High Crag and its buttresses dominating the skyline. Wow, look at that! A hint of blue appears above Fleetwith Pike, maybe the sun will put in an appearance after all. Yes, its definitely starting to clear by the time we reach the head of Buttermere. The view along Warnscale Beck into Warnscale Bottom as we cross over Peggy’s Bridge. Also from the bridge, the view of Warnscale Beck flowing along into Buttermere. A view of Haystacks as we walk across the head of Buttermere. Across the field from Haystacks is the imposing Fleetwith Pike, or Fleetwood Mac as its called in our house. One of the residents of Gatesgarth Farm popped its head above the gate and looked hopeful, so we gave in and provided a handful of fresh grass and left it happily chomping away. 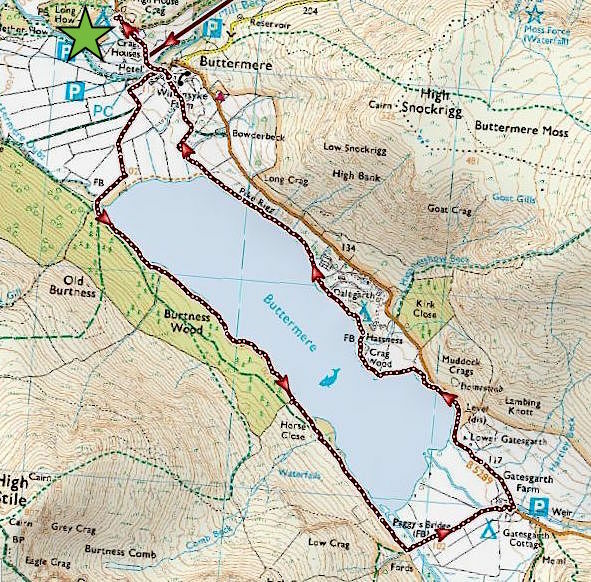 Having crossed over the head of Buttermere we now have a short section of road walking to do before we can pick up the lakeside path again. On the opposite shore we get a great view of the High Stile group of fells. A look back to Fleetwith Pike and Haystacks from the road section. The gammy leg and foot are now beginning to complain. The road isn’t very wide and fortunately there wasn’t a lot of traffic to dodge as we made our way along to the lakeshore path. A shaft of sunlight lands on the fell side just above the pines, and we have a good view of Burtness Comb between High Crag and High Stile. Here’s where we leave the road and rejoin the lakeshore path. The section of path running through the gorse just below the parked car was extremely muddy and awkward to negotiate. A look back to the Buttermere Pines and Haystacks, over to the left, with High Crag dominating the skyline over on the right. On the skyline from left to right are High Crag, High Stile, Red Pike and Dodd. The lower slopes of Haystacks get a few seconds of sunshine which was quickly followed by a longer cloudy period. It was one of those days when the gaps between the clouds just weren’t big enough to provide us with long sunny spells so by the time the camera was ready we were back in the shade again. Walking along the lakeshore path on the north side of Buttermere with plenty of others doing just the same. A look back to the head of Buttermere which was enjoying another brief spell of sunshine. The path becomes quite narrow in places and is often quite close to the water so watching where you were putting your feet, especially as the stones were wet and muddy, became a little more necessary. We reach the tunnel which has been hewn through a crag on the shoreline. It was full of puddles today and its just wide enough for single file only so all we could do was just splash through them and hope for the best. Its only a few yards long so in just a few seconds we are out on the other side, with slightly damper trouser bottoms than we went in with. Beyond the tunnel the path widens again and at the far end of the lake we can see the flat top of the southern end of Mellbreak. On the right, on the opposite shore, the snow is picking out the diagonal rake on High Crag’s Sheepbone Buttress. There is a route up to High Crag summit through there but its very steep and full of boulders. The usual route up High Crag follows the diagonal slope on the skyline, that’s very steep too but at least it isn’t full of fallen rock. Despite the ever increasing size of the blue patches it always seemed to be sunny somewhere other than where we were as we walked back to the village, and Grasmoor is now free from cloud. The long ridge of Rannerdale Knotts is cutting across the centre of the shot. The village, with Mellbreak behind it, is back in view as we make our way along the soggy path. A final look back along the water just before we reach the village. We pass this old barn in the grounds of Syke Farm …..
….. and then we reach the farm tea rooms, where they make their own ice cream, and its so good that we can never pass by without treating ourselves to one. The roadside entrance to the tea rooms, where we would normally turn up towards St James’s Church to where the car would be parked. As we couldn’t find any space there earlier we have to go down the hill and walk a little further on to the National Trust car park just a short distance above the village. So, the gammy leg made it but it has been aching and not best pleased all the way back so perhaps today’s walk was just a little too far to be comfortable. The sunshine never really got going thanks to the large amounts of cloud but it was pleasant enough, and a stroll around Buttermere is always enjoyable.